We know our life is so convenient by new technology. One of reason is that technology reduces a lot of complcated process until getting a result. 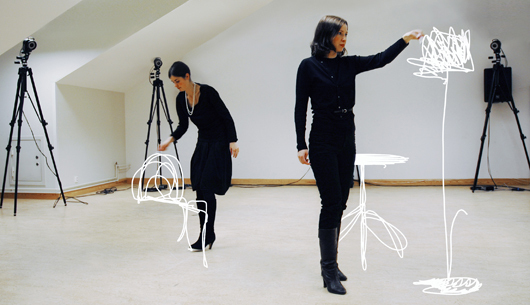 Here is a project, called sketch furniture, which consider this idea. "The four FRONT members have developed a method to materialise free hand sketches. They make it possible by using a unique method where two advanced techniques are combined. It is known to be a very common problem in humankind: Navigation. I believe, the way we put ourselves into local context will change profoundly in the future. Al Gore, James Murdoch in con with Emiko Terazono about participatory democracy. Don't forget to check John Maeda's blog, where he's developing what he calls "The Laws of Simplicity". The research was formatted into a book as well , recently published by MIT Press. The project is sponsored (?) by Philips. Simple, simplify, simplistic, and keep on going. To understand this yearâ€™s Ars Electronica theme â€œSimplicity â€“ The Art of Complexityâ€ was definitely not simple. It wasnâ€™t simple for me, it wasnâ€™t simple for Wolfgang Bednarzek, one of the festivalâ€™s organizer, it wasnâ€™t simple for John Maeda, the MIT virtuous genius; simply, it wasnâ€™t simple. 'Shirley Bassey Mixed Up' is a collaborative biography: an illustrated biography of the legendary diva, where the reader helps to 'mix' the illustrations online, using Internet searches.